Although the sales department brings profitability to a company through a flawless growth of client’s portfolio, it will be unproductive unless you have an adequate human resource pool. The people you hire, their work, skills and devotion contribute to creating and maintaining a prestigious image of your brand. Being in managerial position, having to deal with people at all times, having to split tasks within several branches, and keeping an eye on the overall activity becomes very difficult over a period of time; because you can’t possibly talk to each employee in person or check their everyday activity. And you simply can’t afford to break deadlines or deliver work that’s below expectations. This calls for an efficient resource management program. An efficient resource management program is one that brings in prosperity along with profitability. This single platform must be one that is capable of retaining all data, by connecting you to everyone in your staff, so that you can deliver accurate instructions and relevant information efficiently. It must be one that will help you stay permanently in touch with everyone working on a project plan, keep them in constantly monitored and bring the best out of them. Supervising your employees is a must when you are expecting high quality results and satisfaction from clients or suppliers. An efficient resource management program should be one that provides two important solutions: save time and generate accurate reports. These tools must come along with administrative features to have access to your resources, a booking chart where all the planning and scheduling is done and reports such as financial & utilization which allows you to have a better idea of resources data. Working with people is one of the most difficult tasks; therefore your time will be filled with a wide array of calendars, with specific dates for achieving goals, delivering services, scheduling events and so on. A dynamic resource scheduling program provides great flexibility in use. It should help you group your employees in specific categories and provide specific access to each of them. 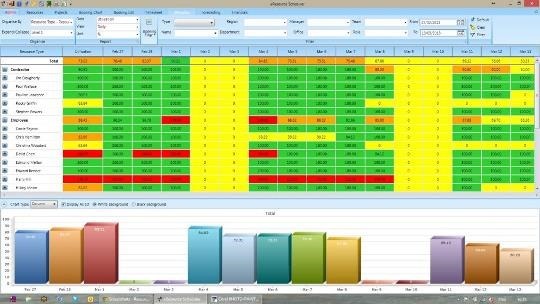 You must also be able to print all reports in Excel sheets or set specific filters to focus on a specific group or task and monitor their results. It’s like being present in multiple places at the same time, keeping an eye on every employee. In the automatic mode, you must have the flexibility to completely manage all tasks, projects and staff by distance. Once to set specific instructions and everyone is trained for their role in completing the job perfectly well, you must only have to wait for the results to be delivered. You must be able to have a clear version of costs, the people working on specific tasks and you must also be able to maintain an evidence of success stories or find what negative issues affect your business. As a resource manager, once you coach and supervise your staff organizing the overall process will only be a matter of a few clicks. You get to save time, because visits to different branches won’t always be necessary, as long as you keep in touch with groups on employees through this software. Sharing different opinions will help you identify issues and constantly improve the performance of your company. A resource management program will help you permanently maintain a tight connection both with your employees and customers. You get to save time, paper, money and boost your business performance exponentially. As a superior you have to supervise everything, keep an eye on your staff, track reports and results and fix all issues in time. Using such an automated resource scheduling tool can just be an able way to assist yourself in weaving the future of your organization. Kathie Miles is a resource coordinator and a geek by nature. She writes about how a software can help managers to plan their resources effectively. She recommends eResource Scheduler for efficient management of resources for organizations.